The fate of the book is widely debated, though for some its disappearance is a foregone conclusion. But what about the fate of a book that discusses the technologies that are displacing the book? Interestingly, one such book, The Shallows by Nicholas Carr, seems to have staying power three years after its publication—a rather long time in our digital era of relentless innovation and creative destruction. The Shallows still shows up in blog posts. It’s frequently mentioned in reviews and articles that address the social and educational impact of the Internet. And it’s a regular text in college classes on media studies. Carr’s concern about Internet usage began in a very personal way with his own experience: What’s the Internet doing to my own mind? Over the last few years I’ve had an uncomfortable sense that someone, or something, has been tinkering with my brain, remapping the neural circuitry, reprogramming the memory. … The boons are real. But they come at a price. As McLuhan suggested, media aren’t just channels of information. They supply the stuff of thought, but they also shape the process of thought. And what the Net seems to be doing is chipping away my capacity for concentration and contemplation. Whether I’m online or not, my mind now expects to take in information the way the Net distributes it: in a swiftly moving stream of particles. The depth of our intelligence hinges on our ability to transfer information from working memory, the scratch pad of consciousness, to long-term memory, the mind’s filing system. When facts and experiences enter our long-term memory, we are able to weave them into the complex ideas that give richness to our thought. But the passage from working memory to long-term memory also forms a bottleneck in our brain. Whereas long-term memory has an almost unlimited capacity, working memory can hold only a relatively small amount of information at a time. And that short-term storage is fragile: A break in our attention can sweep its contents from our mind. Psychologists refer to the information flowing into our working memory as our cognitive load. When the load exceeds our mind’s ability to process and store it, we’re unable to retain the information or to draw connections with other memories. We can’t translate the new material into conceptual knowledge. Our ability to learn suffers, and our understanding remains weak. That’s why the extensive brain activity that Small discovered in Web searchers may be more a cause for concern than for celebration. It points to cognitive overload. The Internet is an interruption system. It seizes our attention only to scramble it. There’s the problem of hypertext and the many different kinds of media coming at us simultaneously. There’s also the fact that numerous studies—including one that tracked eye movement, one that surveyed people, and even one that examined the habits displayed by users of two academic databases—show that we start to read faster and less thoroughly as soon as we go online. Plus, the Internet has a hundred ways of distracting us from our onscreen reading. Most email applications check automatically for new messages every five or 10 minutes, and people routinely click the Check for New Mail button even more frequently. Office workers often glance at their inbox 30 to 40 times an hour. Since each glance breaks our concentration and burdens our working memory, the cognitive penalty can be severe. The penalty is amplified by what brain scientists call switching costs. Every time we shift our attention, the brain has to reorient itself, further taxing our mental resources. Many studies have shown that switching between just two tasks can add substantially to our cognitive load, impeding our thinking and increasing the likelihood that we’ll overlook or misinterpret important information. On the Internet, where we generally juggle several tasks, the switching costs pile ever higher. The Net’s ability to monitor events and send out messages and notifications automatically is, of course, one of its great strengths as a communication technology. We rely on that capability to personalize the workings of the system, to program the vast database to respond to our particular needs, interests, and desires. We want to be interrupted, because each interruption—email, tweet, instant message, RSS headline—brings us a valuable piece of information. To turn off these alerts is to risk feeling out of touch or even socially isolated. The stream of new information also plays to our natural tendency to overemphasize the immediate. We crave the new even when we know it’s trivial. 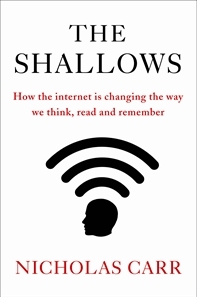 WIRED Magazine’s excerpt from The Shallows, “The Web Shatters Focus, Rewires Brains,” can be found here. I think that what Carr has described is a silent cancer that has not only been eating through indivdual minds but throughout our entire culture. I think it hampers our ability to rightly discern truth and understand the foundational truths to orthodox Christianity because our short-term memories get so overloaded. I wonder whether a bigger problem here is the low quality of much content on the internet, combined with “information overload”. Really high quality information has the power to stop me in my tracks and make me think about it for a while. For example, Simone Weil’s “Gravity and Grace”. Even William James’ “Pragmatism” has me stuck fairly early in with his “tender-hearted” and “tough-minded” distinction. But when the writing quality and thinking quality is poor, this doesn’t happen so much. This pattern is found in mathematics as well: if the symbology is too onerous, you cannot even see some of the patterns that are there. Have you considered the above, especially in the light of how to monetize high-quality output? It strikes me that advertising is the worst possible way to monetize, given its inherently distracting nature (thank God for ad blockers). Thanks, Luke. Good thinking and good writing will always be attractive. And those attuned to such things will be “stopped in their tracks.” For an example of monetizing high level content, check out the First Things website–http://www.firstthings.com/ .